Life Underground: Burrowing Owl /Hawks Aloft Inc. Burrowing Owls are possibly just about the most charismatic of all species of birds. With their brilliant golden eyes and their penchant for living in close proximity to us, they are among the more commonly observed owls. Standing tall on long legs, they may observe us from parks, parking lots, sports fields, and roadside. Their heads bob up and down as if to get a better look at the world that surrounds them. However, life underground for shelter and for nesting has significant hazards. 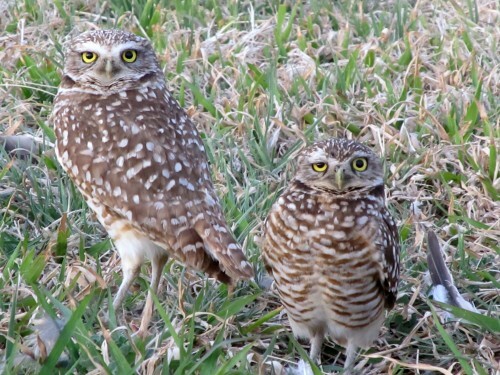 Found throughout the American West, and with a small population in Florida, populations of Burrowing Owl have been in decline throughout their range. The cause is attributed to loss of habitat, human alteration to open areas (such as paving arroyos, highway construction, etc. ), persecution of prairie dogs, collision with vehicles, predation, and more. 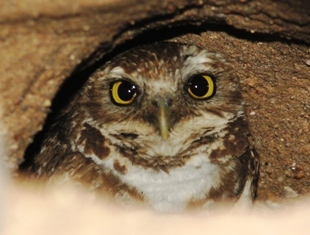 Burrowing Owls often occupy areas in which burrows have been excavated by burrowing mammals, like prairie dogs. Prairie dog towns often occur in those areas that we humans find to be of little value, such as highway right of ways. 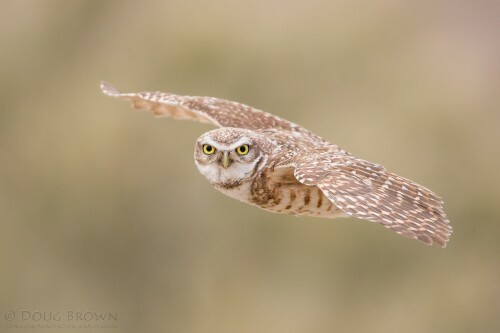 One of the smaller owls, although Burrowing Owls are predators, preying upon mice, insects, moths and even small birds, they also are predated upon by larger raptors, coyotes, dogs and cats. The young are the most vulnerable. As a prey species, these owls can raise quite a number of young each year, although few survive to adulthood. Burrowing Owls have a habit of flying across roadways right about ‘hood-height’ on a vehicle. They are particularly susceptible to collisions with vehicles. 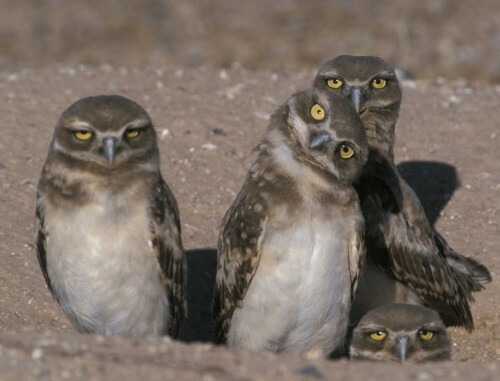 So, the next time you are driving across the prairie or the desert, be sure to keep your eyes open and give the owls a brake!